I have an image of serial number. How can we get serial number text from that image through OCR in asp.net core? >> How can we get serial number text from that image through ORC in asp.net core? I am afraid there is no built-in OCR library from .net core. I am using asp.net core web application. Above link code not build successfully. Have you any web sample project where you get text from image? It's sad that I do not have. As my above reply, there is no built-in OCR function in .net core, you need to try to find the third party library. How can we extract text from image at controller level. Can we extract text with google cloud vision api? I have tried OCR but it is not prefect solution. Please any one share authentic code for extracting text from image . How can we extract text from image at controller level. Use it in your controller or other places are same as long as your Web API is correct. Is there any free library. google cloud vision is paid library. Can you give me some other code stuff? As far as I know, Microsoft does not have other libraries to meet your needs besides OCR. And I am not very clear about other third-party libraries. I have tried some OCR code but not success. I am afraid that all of them are not free since they need a key to activate. You could refer below link to learn how to use it in a C# console APP, then apply it to your WebAPI. "Method not found: 'System.Reflection.Emit.AssemblyBuilder System.AppDomain.DefineDynamicAssembly(System.Reflection.AssemblyName, System.Reflection.Emit.AssemblyBuilderAccess)'." 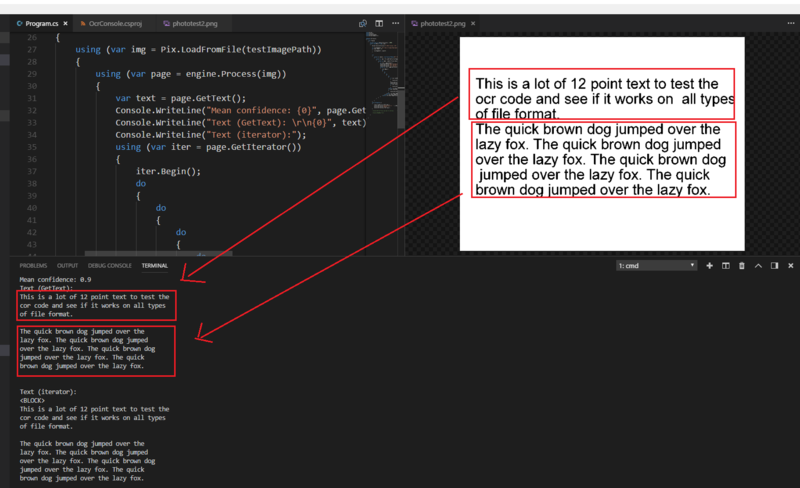 Have any one extract text from image in asp.net core 2.o with OCR? If yes then please post your code and name of libraries. and also post your project. exception,Message:Method not found: 'System.Reflection.Emit.AssemblyBuilder System.AppDomain.DefineDynamicAssembly(System.Reflection.AssemblyName, System.Reflection.Emit.AssemblyBuilderAccess)'. Can any one know how to extract text from image in vs2017 and asp.net core2? As far as I know , the author of Tesseract , Charlesw , has not offered an official package for .NET Core yet . If we would like to use it right now , we have to pull the dev branch from the repo on GitHub and build it by our own . The develop branch is able to be built into .NET Standard lib thus we can use it in .NET Core program . Add a Microsoft.Windows.Compatibility metapackage reference as there's no System.Drawing.Common api in .NET Core . the functions about Bitmap are not available yet .